Pacific Grove artist Keith Larson draws on his childhood memories to create this image of the original Methodist Church, which was located on the north side of Lighthouse Avenue between 17th and 18th streets. The first theme in our nine month PG Library series was about grounding ourselves in this piney paradise. In this week’s column, Patricia Hamilton reflects back on how she and her family arrived in our beloved “Last Hometown.” This story originally appeared in the Keepers of Our Culture column in the 9-23-2016 issue of the Cedar Street Times. California was the Wild West in 1890 when my great great grandparents, the Reverend Sylvanus Gale, his wife Jane, and seven of their eight children moved from Michigan to Pacific Grove to begin their two-year residence as the itinerant Methodist ministers, just as the original resplendent church was completed. The Reverend and his sons built the first parsonage. Like the original church, the old parsonage is now gone. I relocated here in 1990 to visit my aged aunt, Charlotte Berry, who lived in my late Grandfather Harry Murray’s house at 562 Park Place. I’m still here! As a child visiting in PG I loved following scuttling hermit crabs and splashing in the cool waters at Lovers Point. As a teen I ordered bacon waffles when breakfasting with Grandpa Murray at Alioti’s Victorian Corner, his favorite restaurant. As an adult my eyes were opened to the serenity and beauty of the entire area. And maybe it’s also a little “blood memory,” as I felt completely at home the instant I arrived and was welcomed by Aunt Charlotte. The old Methodist church was torn down in the 1960s. Grandpa, raised Methodist but ever the seeker, sat through Sunday sermons with the Baptists, the Congregationalists, and the Evangelicals. He finally committed himself and some hefty tithing to the Catholics. Shocking! Cousin Dave says he gave money to them all, though, trying to cover all the bases to ensure his salvation. What a wonderful idea! Aunt Charlotte was a Seventh Day Adventist. She urged me to join her every Saturday, “The Bible says God rested on the seventh day, the week begins on Sundays, so that’s why it’s right.” Members of her church called her “Charlie,” and she loved that nickname. In memoriam, I purchased a brick etched with her name to support the purchase and planting of the commemorative evergreen tree that’s lit every Christmas, with community singing and celebration in Jewell Park. I sometimes stop by the brick wall around the tree to see her name. Grandpa carved his house into three apartments. He lived in the upstairs apartment facing Jewell Park, and rented out the other top floor apartment facing Grand Avenue, with a peek of the blue waters of Monterey Bay. Charlotte and I lived in Grandpa’s place and I often sat on the front porch, watching Pagrovians enjoying the park. It was a short walk to the Pill Box Pharmacy (now Central Avenue Pharmacy) for Auntie’s prescriptions and to Charlie Higuera’s Grove Market (still here!) for all our groceries. Grandpa’s tenant invited me to attend the Rev. Bill Little’s Pacific Coast Church, which was meeting in the auditorium at Robert Down School on Pine Street. Today their much bigger congregation has found a home in the old Christian Science church on Fountain and Central avenues. That’s where my Uncle Clyde and Aunt Frances worshipped when they came to town. Charline, my mother and Charlotte’s triplet sister, sent us kids to a variety of Holy Roller churches, including the Assembly of God and Church of the Nazarene. Seekers all! I digress. Dr. Bill’s message was inclusive of all the world’s great religions—Christianity, Catholicism, Judaism, Islam, Hinduism, and others. There, I was “saved” from damnation merely listening to the first sermon I heard him deliver. Apropo that I was seated in a back row in a grade school auditorium. Rita Firestone Seger has been a “Carmel girl” for 37 years. This week’s guest columnist, Rita Firestone Seger, demonstrates the truth of the familiar saying about time flying when you’re having a good time in this essay about her life in Carmel and her spiritual journey over the years. This story originally appeared in the Keepers of Our Culture column in the 9-16-2016 issue of the Cedar Street Times. I know it’s true but hard to believe that Bob and I moved to Carmel in January of 1979. So much is different and so much is the same. “They” told us it was hard to make a living here and we probably wouldn’t be able to stay. No, no, we were determined. So what did we do? We came to flip houses and that was happening a lot, as we found out. So architect Bob opened the first kitchen and bath showroom in Carmel, Seger’s Kitchens and Baths. I , being an interior designer, opened The French Collection in the Barnyard. That was not our intention, but you do what you gotta do. We never took for granted living here. We would go out to dinner and say, “A lot of these people in this restaurant have to leave. We live here” To this day, the mountains, the ocean and more are a beautiful sight to behold. In 2005, we moved to Palm Desert. We had been going there for a couple of months every year and when I retired we decided to go to a different climate but with the caveat we would return to Carmel for the summer. This went on for a few years and then Bob was diagnosed with Parkinson’s Disease. He eventually developed dementia along with it, was in a facility for two years, and passed in January of 2013. I continue to come to Carmel in the summer, but only for three months. It’s not quite the same. My son Eric, daughter in law Ziona and my granddaughters Rachel and Becca live in Carmel and I have been so fortunate to be able to visit and be with the girls as they grow up. Now Rachel is off to Cal Poly and Becca is a junior in high school. They work in the summer and are not as available to Nana as they used to be. Nothing is permanent. In the meantime, I did a book in six weeks this summer, My Carmel. I arrived here and was inspired. My inner voice told me to go to the ocean, start taking pictures and do a book. Patricia Hamilton and I worked tirelessly at Park Place Publications. I couldn’t believe the stairs I climbed in P.G. to get to her office. Only through grace did I do that over and over. I ended up with 55 photos in the book that include all the landmarks and some of the stores, the ocean, the trees, etc. I interspersed the photos with spiritual quotes. I now look at this book and truthfully I love it! I am giddy and laugh when I look at it over and over. This person Rita, in the outer form, did not create this book. Spirit just led and I just went with it. Plug: The book is available at Pilgrim’s Way in Carmel and on Amazon. I think the spirit within did a very creative piece of work. Thank you, God. So in total I have been a “Carmel girl” for 37 years. What the future holds is beyond me. Will I be back? Don’t know. I don’t worry about the future and what will be, will be. At least I can say I had the best of both worlds now, the desert and Carmel. Bob and I were blessed to live here. See ya when I see ya. Namaste and with love, Rita. Life in Pacific Grove, California is an exciting new book project being launched by Park Place Publications, to benefit the Pacific Grove Public Library. “Keepers of Our Culture” has launched an exciting new project, Life in Pacific Grove, California, a book of stories by local residents and visitors, to be published in 2017 by Park Place Publications to benefit the Pacific Grove Public Library. Everyone is welcome to contribute a story, but to enhance your experience, w invite you to participate in the FREE monthly memoir classes sponsored by Park Place Publications and the Pacific Grove Public Library. At the conclusion of the monthly sessions in May of 2017, we will publish your stories in a lovely book illustrated by Keith Larson. Stories contributed from the memoir class and other stories sent in will be augmented by interviews with people in the community. The next session is Thursday, Oct. 20, from 2:30 to 4:30 p.m. in the Little House in Jewell Park. The theme will be exploring the joys and trials of your home in Pacific Grove. If you can’t come to the class but would still like to contribute a story to the book, please send a Word doc of 500 to 700 words and a high-resolution photo to: keepersofourculture@gmail.com. 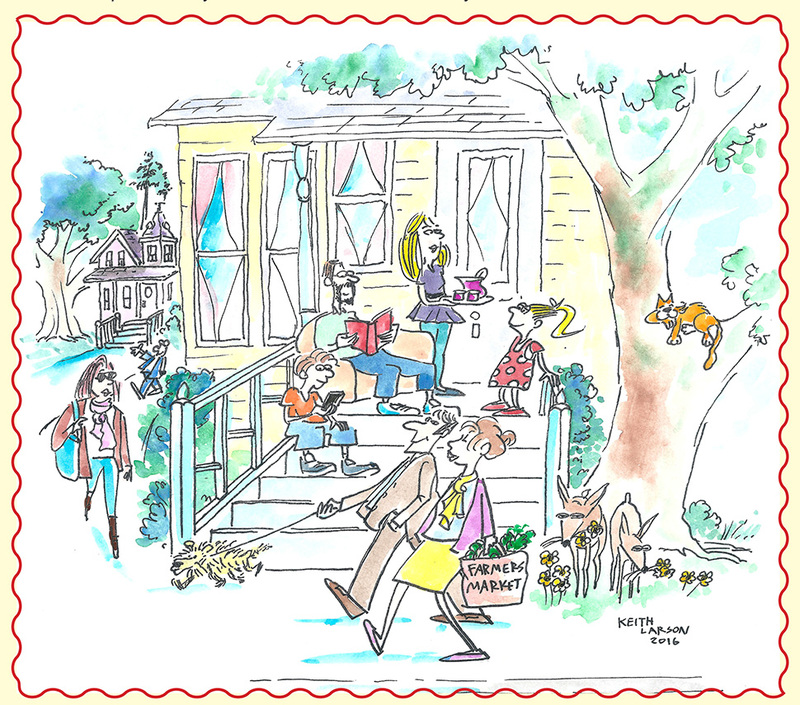 Local artist Keith Larson created this delightful sketch of typical “Life in Pacific Grove” to promote the “PG Writes!” series of memoir classes, co-sponsored by the Pacific Grove Public Library and Park Place Publications. We’re tickled beyond pink to announce the launch of “PG Writes! Life in Pacific Grove.” This monthly series of free memoir classes is co-sponsored by Park Place Publications and the Pacific Grove Public Library, and kicks off this Thursday, September 15, from 2:30 to 4:30 p.m. at the Little House in Jewell Park. Your facilitator, Patricia Hamilton, will lead you through a series of easy and fun writing exercises, all themed around our lives in Pacific Grove. We’ll be using the Guided Autobiography Method developed by pioneering gerontologist Dr. James Birren to assist you in accessing your memories, getting your story down on paper, and sharing it with others. In the process, you’ll create a series of short pieces and will be well on your way to writing your life story, a priceless gift to leave your children and grandchildren, as well as a valuable community historical resource, a snapshot of Pacific Grove at a particular moment in time. You say you’re a newcomer to Pacific Grove and all your significant life experiences took place before you arrived in the Last Hometown? Join us anyway! The fact is, you’re here now, and everything that has happened to you up to this point—whether it is as lofty as a lifelong yearning for the scent of salt water mixed with pine and eucalyptus, or as mundane as a job transfer—has led you to your present life in Pacific Grove. We Pagrovians are a diverse lot, but we all share the knowledge that this is a very special corner of paradise, and that we are truly lucky to live here. Whether we were born on the peninsula decades ago and chose to remain, or made the decision to turn our dreams to live here into a reality, we all cherish the special blend of salubrious climate, natural beauty, and Victorian charm. We owe it to this enchanting place to record and share our “Life in the Grove” stories. Two weeks ago, Pacific Grove cartoonist Keith Larson demonstrated this concept with his sweet essay on his childhood memories of listening to the whistles of the Del Monte Express as it rumbled through town, and of young men finding jobs at the American Tin Cannery when it was an actual working factory making car seat covers for Chrysler. This week, you may admire Keith’s artistry illustrating this column, and on the “PG Writes!” poster at the library. Our series of free memoir classes will continue on the third Thursday of each month from now through May of 2017. You may come to just one or all nine sessions, or any combination that fits your schedule. Admission is free and all materials will be provided. Because space is limited in the Little House, pre-registration is a must. Sign up online at KeepersOfOurCulture.com. Please register for only one month at a time, and only for the upcoming month. If you cannot attend, and would like to contribute your memories of living in Pacific Grove to a new book due out next year, please send your stories (100-500 words), and a high-resolution photo to: keepersofourculture@gmail.com. Or to 591 Lighthouse #10, PG for snail mail. All entries must be received by June 1, 2017, to be considered.